One commenter here mentioned he should probably only watch home games from now on. You can really start to say this team is night and day when it comes to road games versus home games. We should have expected this given the team's youth but after watching some great home performances so far it's difficult to believe the team can play this bad anywhere. The Patriots, who I thought might struggle with the Huskies' front court, had no answer for Chaisson "Mason Killin" Allen. Allen had 20 points and sank 6 three-pointers, most in the first half. As a team Northeastern went 9-for-18 from the three-point and that's just unacceptable. The Huskies did have a great night shooting the ball but the Patriots made it too easy for them early and struggled to mount a comeback. I don't see this team coming back from too many deficits on the road this year, the experience and mental edge just isn't going to materialize overnight. Ryan Pearson was the only bright spot for the Patriots as he collected 20 points and 10 rebounds. He helped Mason amazingly collect more offensive rebounds but I guess if your the Northeastern and your aren't missing many shots you won't be getting many offensive boards anyway. His grit and toughness around the basket would have complemented some of the guards greatly if they actually hit some outside shots last night. Once the Patriots get off their balanced attack game plan and become one-dimension like they did here, it's over. Mason doesn't have that one guy who can carry the team to victory, they need a collection of guys driving to the basket and hitting the outside shot while also looking for the fast break opportunity. 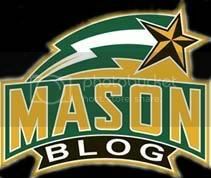 The CAA schedule gets a tad bit easier for Mason as Hofstra might be the only road challenge up ahead. This team might largely benefit from not having to play William & Mary nor VCU on the road this season. It happened last season too, they'd get behind and start jacking 3's (I commented on another board that I had thought Dre Smith graduated already). Why can't Coach L get these guys to stick to a game plan?